The subjugation mentality as a result of over 500 years of occupationist colonial rule continues to haunt natives of these former colonies. Why, because they continue to or are made to think the white man has all the answers to the world’s ills. Unfortunately, despite coining all international laws, starting international humanitarian programs, defining what’s right and what’s wrong they have also been responsible for encouraging a steady flow of ideologies that have facilitated these western countries to enter the milieu with their notions of what should and should not prevail. All these have taken countries experiencing conflicts nowhere – Sri Lanka managed to eliminate terrorism, the first nation to do so but what it has not done is to completely break the Eelaam Ideology – for unless the separatist mentality is legislatively and legally annihilated the country will not progress towards any form of reconciliation. Sri Lanka’s main opposition wisely addressed this need the month following the LTTE military defeat in 2009 requesting the Government to “defeat Eelaam ideology and to take action on Tamil political parties to remove the Eelaam tag from their names”. 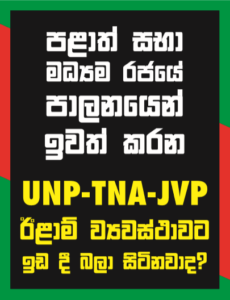 UNP has also realized the need to defeat the “concept of eelaam” an ideology that would likely be launched politically since the LTTE is now no more – the statement is welcome coming from a party that was ready to legally recognize LTTE territory. There are many contradictions : On the one hand the Eelaam is promoted as being only for Sri Lankan Tamils inside Sri Lanka but then there are also calls for a Greater Eelaam gathering thoughts from all the Tamils in the world which leads us to believe that this quest is hiding the reason d’etre for their real existence. We know that this is true because calls for a Separate Tamil Land emerged in Tamil Nadu – in fact they wanted a Greater Dravidistan incorporating all Tamil speaking states in India – which included Andhra Pradesh, Karnataka and Kerala as well. Realizing that too much greed would get them nowhere they opted to first go for the Tamil Nadu separatism which was crushed successfully by India. We know that Sri Lanka is an experiment – to see how a sovereign state can be carved and devolved into a minority state – a model that will spread to other parts of the world. So before any struggle what was important was to carve out an IDEOLOGY – one that would keep hidden from the world that REAL Eelaam was in Tamil Nadu – the ultimate place that would eventually flag a Separate Homeland for Tamils of the World in India. But that fact needed to be kept hidden from global purview and mostly from within India – India would not allow Tamils a TRANSNATION State but this was their hidden objective something ordinary Tamils maybe unaware of. It was because of this greater plan that all the efforts to offer a compromised solution were scoffed at because the real desire was to ask for more. Sri Lanka cannot give the “more” it is India. In order to do that the Ideological Sing Song had to have plenty of frills and trims and it needed to be concentrated only on Sri Lanka (probably India’s assistance would have been selfishly given to keep Eelaam from returning to haunt India’s South). Sri Lanka has had 30 years of nightmares to keep India’s South safe and we are now no longer ready to keep up the charade. But how can transnational’s speak on behalf of Sri Lankan Tamils? The Tamils need to realize that given that we are arguing over something called “Tamil areas” – in 30 years what did any Tamil do to develop or improve infrastructure or at least provide basic requirements? Did Prabakaran, the LTTE or any of the Tamils comfortably living overseas and telling their poor people to fight care to provide a hospital, school or improve the roads? NO they didn’t and it is the Sri Lanka Government that even fed the LTTE because the LTTE confiscated the food sent to the North. All those whining presently about the lack of this and that may well like to ask exactly the LTTE gave the ordinary Tamil people! People listening to the LTTE and Tamil politicians calls for a separate state for Tamils because of Sinhala discrimination may well like to first ask if Sinhalese are discriminating against the Tamils why are more than 1m Tamils living and working with the Sinhalese including the TNA politicians while there are less than 500,000 living in the North? Have any also thought that the humanitarian organizations are crying foul because when a government declares there are no refugee camps – these organizations will have no reason to collect funds from generous hearts overseas? All these comparisons appear to end up at the doorstep of the dilemma that prevails between the haves and have nots. It was the haves that rallied behind the LTTE – going so far as to raise funds, campaign internationally, influence foreign leaders totally ignoring the fact that LTTE comprised men, women and children brainwashed into praying to a demi-god, being trained to kill and pledged to kill themselves by committing suicide – how many Tamils would have lost opportunities by being forced into the jungles for training. Were these not poor and low caste Tamils who made up the fighting force of the LTTE? Were these not the people that fled from the LTTE into the arms of the saviors – the Sri Lankan military? What was the reaction of the Tamil Diaspora – they were quick to cry genocide, mass killing and demand war crimes giving every penny to hide that 294,000 Tamil civilians were saved by Sri Lanka’s military. Were these people given even a glass of water by those that are now demanding swift action and deadlines from the Sri Lankan Government to look after these rescued Tamil civilians – were these Tamil people not starving, malnutritioned, and suffering various illnesses and should it not be the LTTE and the Diaspora that should take responsibility! In short if we go by the arguments that Diaspora uses – it was the Sinhala army that saved these Tamil civilians, it was the Sinhala army that fed, clothed and treated the wounds of these Tamil civilians – where were the Diaspora? Yet, there are scores of Tamil charities and humanitarian organizations all funneling funds supposedly to look after their people – but surprise, surprise when the Sri Lankan military walked into the North for the first time there were not even proper roads though LTTE and their families enjoyed all the fruits of funds sent. Truth is LTTE was no liberation movement. Let us assume it was – if the ultimate aim was to create a Tamil Eelaam for Sri Lankan Tamils in Sri Lanka, they would need eminent Tamil politicians, academics, civil society leaders but WHY did the LTTE kill all these Tamil leaders of society and standing? Only a terrorist organization would do what the LTTE did to its own people. LTTE is now no more – however there is a global call using the excuse of war crimes, genocide and all the fancy words available in the UN dictionary to keep alive a hidden agenda. Let us not be naïve that the LTTE cannot re-emerge. It was a terrorist organization based on a cult-like movement worshipping ONE man and his objective to become leader of an entire territory. Whether he shared any part of aligning with the greater Eelaam is an answer that died along with Prabakaran. However, Prabakaran would never have allowed any other to be above him therefore we can assume that Prabakaran would have not survived or given a part of a greater Eelaam – thus he was being silently used all along. Again, the real eelaam strategists are still hidden, they are nevertheless trying all sorts of pot shots – we have some cyberspace transnational e-government, we have Tamils from different parts of the world slowly lobbying together, there is an amazingly large wealth pot of illegal and legal money, we have Tamil Nadu rising finally into action – so the real eelaam agenda continues to remain hidden but its ideology prevails and is gaining ground even in Tamil Nadu calling for India to once again crush this as it did in the 1960s. Sri Lanka cannot solve or stop eelaam ideologies springing up in other nations, frankly it should not be our headache. Our concern should be within our territory and limited to that which challenges our sovereignty and applies to our citizenry. No integration can take place when at the back of people’s minds there are those hinting and chirping about separating. This is something that the Sri Lankan Government needs to first address. The international community may well think it is in their right to demand timelines, action plans and whatnot but what needs to be first addressed is the question of whether Sri Lanka has adequately handled the Eelaam Ideology – it hasn’t and obviously there are quarters keeping Sri Lanka from addressing this need because they are well aware that Sri Lanka’s SOLUTION will fall on its face when it has neglected to eliminate the Eelaam ideology. Germany is where it is today because the Allies totally annihilated Hitler and all his ideologies – the same can be said of Japan as well….therefore, Sri Lanka should not be hoodwinked into going in a direction that is moving it away from dealing with the first obstacle – which is to eliminate Eelaam Ideology in Sri Lanka. For starters we have written in our constitution clearly that no party or individual can advocate separatism – our question is why is the Sri Lankan Government tolerating the TNA and all its associated parties? The TNA is a major obstacle to Peace in Sri Lanka, its manifestos clearly advocates separatism, federalism and it is no other than an agent conspiring against the country, why is the Government not doing anything about a group of politicians who are brainwashing the Tamil people and doing politically what the LTTE did with their gun? We have come to a stage where faulting TNA on political stages and over media is simply not enough and exposes discrepancies in proper policies that should be in place to reconcile the people, integrate the people and allow people of Sri Lanka to live peacefully and with solidarity. Similarly, any other forms of extremism emerging from different quarters needs to also be nipped in the bud whatever funds they may give for the inaction. Allowing this second threat to slowly raise its head is going to lead to another battle that Sri Lanka’s armed forces should not have to sacrifice their lives for delay follies of Sri Lanka’s elected representatives. No Sri Lankan – political party, organization or individual can advocate any type of separatism in Sri Lanka now or ever and that message must be clear, precise and advocated with legal consequences to all of Sri Lanka’s citizenry punishable under Sri Lanka’s law to all.